The kitty in the picture is my precious baby doll Amahle. Because she is a girl, when I say “my cat”, I say minha gata. If my kitty was a boy, I’d say meu gato. If I had two cats and one was a boy, I’d say meus gatos. Yes, in Portuguese, the possessive pronouns vary in gender (masculine and feminine) and number (singular and plural). As you can see from the examples above, it doesn’t depend on who owns, but on the gender and number of what is owned. That is the case for most of the possessive pronouns, but not all. Let me show you how to use possessive pronouns correctly in Portuguese. You will find practice exercises at the end of the lesson. These pronouns agree in gender and number with the item that is owned. These pronouns are placed before the object that is owned. Let me show you these pronouns one by one. Minha casa é bonita. = My house is beautiful. Meu casaco é vermelho. = My coat is red. Teu pai é engraçado. = Your father is funny. Tuas irmãs moram em Recife? = Do your sisters live in Recife? Yes, this seems confusing, right? The context will tell you what the pronoun means. Sua namorada é gente boa. = Your girlfriend is cool. Quantos anos os seus irmãos têm? = How old are your brothers? Adoro Caetano Veloso. Suas músicas são lindas. = I love Caetano Veloso. His songs are very beautiful. Você conhece a escritora Clarice Lispector? Seus livros são fantásticos. = Do you know the writer Clarice Lispector? Her books are fantastic. Você já ouviu a banda Capital Inicial? Suas músicas fizeram muito sucesso nos anos 80. = Have you heard the band Capital Inicial? Their songs were very popular in the 1980’s. 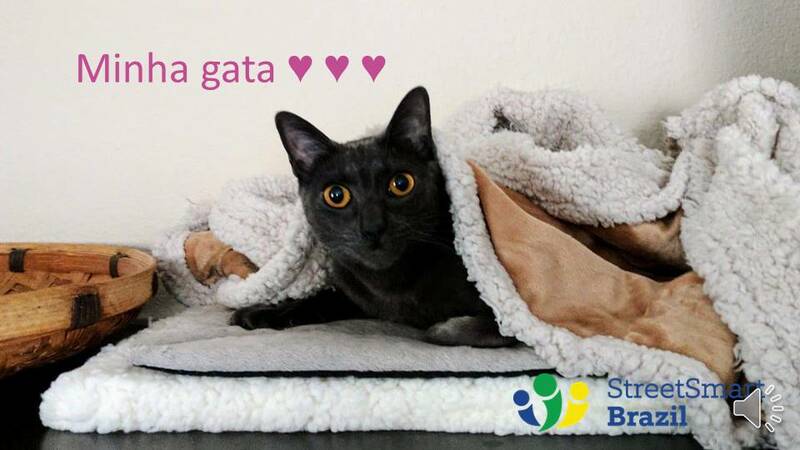 Nosso cachorro e nossa gata são muito doces. = Our dog and our cat are very sweet. Nossos amigos gostam de futebol. = Our friends like soccer. As you’ve seen, we use the same possessive pronouns for você and for ele, ela. That means that we use the same possessive pronouns to say your and to say his, her, their. That seu can be confusing, right? We make things clear when we use Dele or Dela. = Maria’s house is beautiful. Her house is beautiful. = Paulo’s house is beautiful. His house is beautiful. Melissa’s and Ana’s house is beautiful. Their house is beautiful. = Ana’s and José’s house is beautiful. Their house is beautiful. 1. Adoro Caetano Veloso. As músicas dele são lindas. = I love Caetano Veloso. His songs are very beautiful. 2. Você conhece a escritora Clarice Lispector? Os livros dela são fantásticos. = Do you know the writer Clarice Lispector? Her books are fantastic. 3. Você já ouviu a banda Capital Inicial? As músicas deles fizeram muito sucesso nos anos 80. = Have you heard the band Capital Inicial? Their songs were very popular in the 1980’s. Meu pai or O meu pai? I hear this question a lot and I even see Brazilians correcting Portuguese speakers and telling them to use the article. The use of the definite article is optional before the possessive pronoun. That is what our grammar says. Both forms are perfectly correct. The use of the article has an impact on the use of the preposition DE or DO (which is the contraction of DE + O). Practice is the key to speaking a language with ease and with confidence. 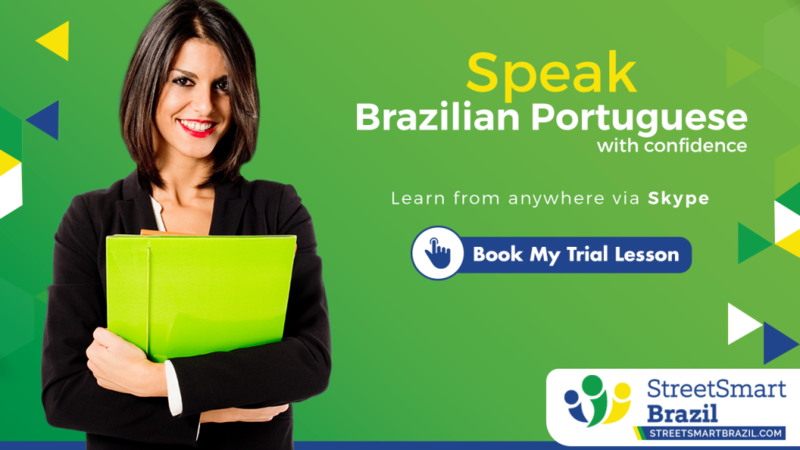 Speak Portuguese that you are proud of: Book one-on-one lessons via Skype with a Street Smart Brazil professional instructor. Fill in the blanks with the correct possessive pronoun. The answers are below. Oi, (1) ___________ nome é Antonieta. Eu sou de Recife. (2) ______________ família não é muito grande. (3) ___________ marido se chama Bernardo. (4) ______________ filha se chama Melissa. Ela é casada e tem uma filha. (5) ____________ neta, Luana, tem sete anos. O marido de Melissa é americano. Ele é um homem muito bom. O nome (6) ______________ é Rob. Sueli: E aí, como vai o (7) _____________ namoro? Ana: Ah, o (8) ___________ namoro vai bem. O Joaquim é tudo de bom. Sueli: Você gosta dos amigos (9) ______________? Ana: Gosto, sim. Os amigos do Joaquim são todos legais. Sueli: E como é a família (10) _______________? Ana: A mãe (11) ____________ é muito simpática. O nome (12) _____________ é Solange. O pai (13) _____________ é mais sério, mas também é gente boa. A casa (14) _______________ é linda. Oi, (1) meu nome é Antonieta. Eu sou de Recife. (2) Minha família não é muito grande. (3) Meu marido se chama Bernardo. (4) Minha filha se chama Melissa. Ela é casada e tem uma filha. (5) Minha neta, Luana, tem sete anos. O marido de Melissa é americano. O nome (6) dele é Rob. Sueli: E aí, como vai o (7) seu namoro? Ana: Ah, o (8) meu namoro vai bem. O Joaquim é tudo de bom. Sueli: Você gosta dos amigos (9) dele? Sueli: E como é a família (10) dele? Ana: A mãe (11) dele é muito simpática. O nome (12) dela é Solange. O pai (13) dele é mais sério, mas também é gente boa. A casa (14) deles é linda. This post was originally posted in March 2009 and has been improved and updated. Hi Luciana, if you allow me, I’d like to leave here a invite to all people who are learning portuguese to visit my channel on youtube. I use dedicate sometime posting brazilian songs with portuguese lyrics there because I think It’s very productive to all people learn a new language through music, sorry for my english, I’m brazilian, follow below the link, thank you, Obrigado! Take a look in my channel on youtube I have good brazilian songs with portuguese lyrics there! I think is a very good way to learn a new language, I’m brazilian and I created this channel to help all people with portuguese. I know you are using the Portuguese terminology, but in English it’s better to call them possessive adjectives anyway, because things might get confusing otherwise. For instance, you mostly talked about adjectival possessive pronouns (which in English are called “possessive adjectives”), in which the articles are optional. But when it comes to substantival possessive pronouns (which in English are referred to as “possessive pronouns”), the articles cannot be left out. i.e. : Este é meu livro, aquele é o seu. Minha família vai bem, e a sua? muito obrigado…. can you take one class about irregular verbs. who can we identity irregular verbs in Portuguese. any logic? Eu gosto muito disso. Bom trabalho! Gosto muito de tudo! Obrigada. Thank you so much for this and the other lessons you have prepared! I have learned so much here!